Five college students go to a remote shack in the woods and find an audiotape which they play, unfortunately for them it contains passages from the Necronomicon and conjures forth malevolent demons. The teens are picked off one by one and possessed by the evil deadites. The first feature from talented director Sam Raimi, this is extremely violent and gory and had trouble getting a distribution deal despite eventually making millions. 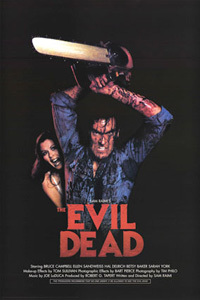 Bruce Campbell plays Ash probably the greatest horror hero ever created and he reprised the role in the two sequels. The Evil Dead is an absolute classic and should be on the shelf of every self-respecting horror fan.